Pick out exciting and fun 3rd grade chapter books to get your student reading in his or her spare time. Many of the classic stories are read in class, so look for ones that are exciting and enticing to your child to read a home or during free time. Horrible Harry Moves up to Third Grade by Suzy Kline is part of a book series about Horrible Harry. In this edition, Harry, Doug and Sidney all learn to navigate third grade and their friendships through some funny and difficult times. I Was a Third Grade Science Project by Mary Jane Auch is about three boys who team up to hypnotize their dog into thinking it is a cat, with some unusual results. Third Grade Stinks! by Colleen O' Shaughnessy McKenna follows Gordie in his plans to get rid of his locker-mate Lucy. Class Clown by Johanna Hurwitz follows Lucas as he tries (and often fails) to behave in his 3rd grade class. How to Eat Fried Worms by Thomas Rockwell is a hilarious tale of a bet between two boys over eating worms to earn money for a new bike. The Door in the Wall by Marguerite De Angeli is a historical story about a boy who falls ill in medieval England, and learns how to serve his kingdom. This book won the Newbery Medal. Charlotte's Web by E.B. White has quickly become a classic children's tale for elementary aged students. They will delight in the unexpected friendship between the spider Charlotte and the pig Wilbur. Sideways Stories from Wayside School by Louis Sachar is a crazy tale about the various happenings at Wayside School, a 30-story building filled with unique individuals. After you finish reading each short story in this book that are connected by various characters, take the Wayside School quiz from LoveToKnow. The Mouse and the Motorcycle by Beverly Cleary is a classic tale about the friendship between a mouse named Ralph who loves his motorcycle that was given to him by the boy named Keith. Freckle Juice by Judy Blume is a short chapter book perfect for struggling readers at the start of the 3rd grade. In it, Andrew buys a recipe for freckles with some funny results. Mr. Popper's Penguins by Richard Atwater is a cute tale about a man who dreams of going to the Poles and instead ends up with his own troupe of performing penguins. This book is a Newbery Honor book. Third-Grade Detectives is a series by George E. Stanley that follows Todd and Noelle on their adventures in 3rd grade. The Boxcar Children book series by Gertrude Chandler Warner follows a group of orphan siblings who live in an abandoned boxcar until they are taken in by their grandfather, who then moves the boxcar to the backyard and have subsequent adventures together. Cam Jansen Mysteries by David Adler follows the adventures of Cam Jansen as she solves many mysteries in this exciting series. In addition to the mystery books, many other series are perfect for 3rd graders. For example, Little House on the Prairie books are excellent reading choices for advanced third graders, or as read-alouds in the classroom or at home. 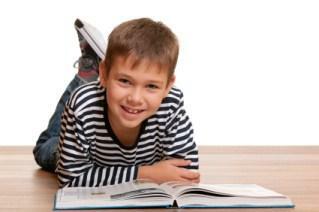 Use 3rd grade chapter books to help get your child excited about reading outside of the classroom. These are just a few of the many options available; check with your local librarian or your child's teacher for more recommendations.